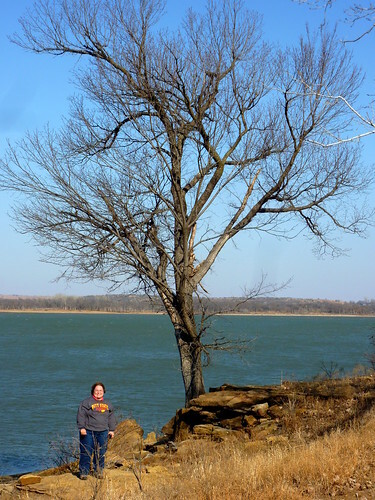 The penultimate day of 2010 was unseasonably warm and windy, reaching over 70 degrees Fahrenheit with winds of over 20 miles per hour in southeastern Kansas. I drove 20 miles north to Caney and picked up fellow science teacher Betty Henderson for a day hike 45 miles more miles north at Fall River State Park. We paid a day use fee and drove into the Fredonia Bay area to hike the 1.5 mile loop at Casner Creek. This trail was mostly a mown path through grassland and was not photogenic this time of year. After an uneventful trip through the grass for over half a mile we reached a small bridge over dry Casner Creek. The trail soon turned back north and we could glimpse Fall River Lake up ahead. The lake was down considerably and we managed to spook a deer or two. I spied an old board and tried to windsurf on it, but the water was too low. After crossing what I termed Brokeback Bridge, we returned to the trailhead, with tall grass leaning over in the strong south wind. A drive over to the lake shore gave Betty a chance to explore a small ledge below a tree before spotting a massive tree with exposed gnarled roots. It was surrounded by partially eaten hedge apples. Throughout the day she was on the lookout for an eagle she had seen earlier, but mostly saw hawks and gulls. Driving over to the Quarry Bay area northeast of the dam, we ate Subway sandwiches we had purchased in Independence. We then set out on the linked Overlook, Post Oak, Catclaw, and Bluestem Prairie trails for a combined loop of three miles. Thankfully most of these trails were in hollows and amongst trees offering some shelter from the strong wind. We saw a small sandstone ledge which we would return to later in the loop and use for a breather. The Post Oak trail was the prettiest one, with a few lichen-covered sandstone outcrops and a view over Craig Creek. The trail wound around to an overlook of the lake, and then we crossed the largest pedestrian bridge of the day to a small creek leading into Quarry Bay. There were a few large boulders by the trailside and after crossing the creek we travelled through a winter-barren thicket towards Quarry Bay. The trail led south down the east side of the bay through tangled trees which in winter resembled a massive cobweb. Our last stop was over below the dam. As soon as Betty saw the old bridge across the river here, she recalled this as where her parents took her and her brothers to fish many years ago. We went down to the river to shoot the bridge. Along the way Betty hooted about a crazy set of signs that seemed to encourage those in wheelchairs to cautiously wheel down a steep metal stairway. It was a fun sunny day allowing me to experiment with different iPhone trail apps, using one of them to easily create an interactive trail map, albeit for the inferior Casner Creek trail.